Probably the prettiest stretch of the Crawfish River, this is a relaxing ride on a slow stream where you shouldn’t ever have to worry about water levels or portaging obstructions, instead take in the outstanding wildlife and attractive surroundings. This trip is a perfect place to decompress with friends and just float downstream on a lazy weekend afternoon. Time: Put in at 2:40p. Out at 5:30p. Wildlife: Great blue heron, sandhill cranes, painted turtles, frogs, flopping fish, muskrat, snowy egrets (in season), groundhog, flopping fish, deer, turkey and pheasants. The Crawfish doesn’t get much love. It’s wide, slow, deep and flat. It’s mostly surrounded by fields of corn or soy. What’s there to love? Hell, what’s there even to like? Well, the upstream portions – that is, before the Beaver Dam merges with it, after which the two already wide streams become a big fat boring river. Up here it’s surprisingly pleasant. This trip begins and ends at an official Glacial Heritage Area landing; the takeout in particular provides a designated parking area too as part of the Waterloo Wildlife Area. The mostly contiguous parcels of land comprising the wildlife area are by no means wilderness – you’ll encounter some houses as well as many farm fields and barns – but where the surroundings are isolated, the effect is one of true intimacy. One fun novelty of this trip is the option for getting sidetracked (in a good way). There are several opportunities for backwater exploration, most of them on river-right and between the put-in and County Road BB. The first of these is within the first mile, where you’ll even see a small undeveloped landing on the right. It leads to a small wetland with very pretty surroundings. Another is the mouth of the Maunesha River itself, which you can paddle upstream as far as your heart desires (the current is slack, so this is easy to do). There’s a surreal rock quarry with almost otherworldly-looking mounds of golden sand that’s pretty cool to look at. Below County Road BB are the only islands on this trip (and some of the only anywhere on the Crawfish). They break up the stream and offer a couple places to get out and stretch your legs. 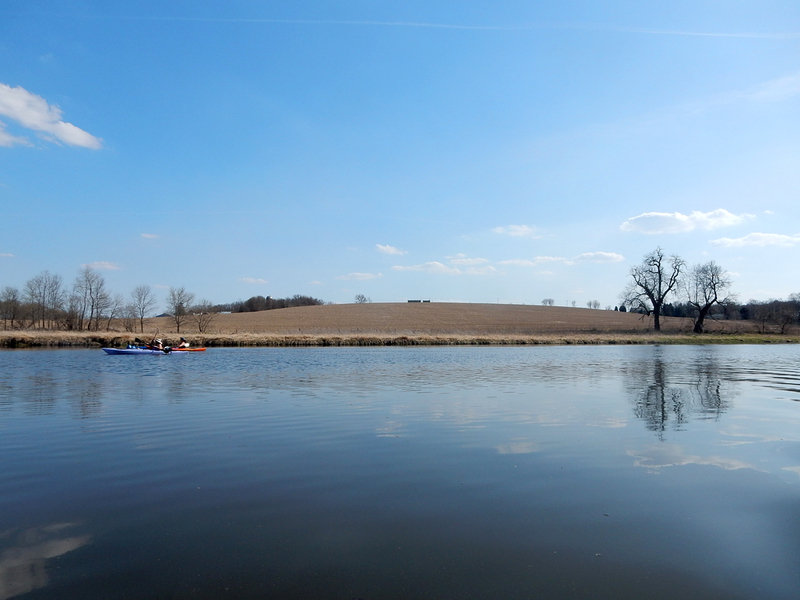 The stretch between BB and the takeout is a bit more agricultural than the upstream portion but the perspective from the water remains pretty and tranquil. There’s a steep hillside to the right with a couple attractive oak trees and boulders. There’s another backwater to explore on the far left about a half-mile upstream of the takeout. Be sure to look behind you about from time to time, as there’s a lovely hill that provides a great backdrop to this bypassed section of the Crawfish. Exploring the backwaters is always a fun diversion. You just never know what critters will be hanging out back there. We saw a focused heron hunting for frogs, paying us no mind. There are a few scenes of soft hills in the background – particularly esthetic in autumn. As you approach County Road BB you’ll see an iconic barn atop a small hill overlooking the river valley, quintessential Wisconsin. The islands in the second “half” of this trip add a dash of distinction, and there are several moments here and there where the landscape feels nicely preserved (despite the development often nearby). All in all, given that the Crawfish is a wide river, there are several stretches just in this short trip where the feeling while on the water is one of intimacy. The first mile is pretty unremarkable. After a right and left bend, you’ll pass a random road with a line of houses tucked in the base of what otherwise would be a very cool looking drumlin. After this another mile of somewhat monotonous woods on river-left (but it all improves after this, where the scenery really is lovely.) To be sure, the current is next to nonexistent and the water is deep and muddy. You don’t want to paddle against the wind on this river, as it can be very unforgiving. But no one would seek out the Crawfish for its clear water, fun current or sense of privacy. Rather, this is a solid and truly pleasant float trip with friends for an easy day on the water. I really like this trip and would do it again (actually, this was my second time). I don’t recommend it in spring, however, as the bare trees don’t really add to the experience. Instead, this trip is especially pretty in autumn, with blushing foliage here and there. Easy put-in at County Road I. Entering the Wateloo Wildlife Area. One of several inviting backwater (October 2014). Very palette of colors in autumn (October 2014). Approaching the County Road G bridge (October 2014). Takeout at County Road G.